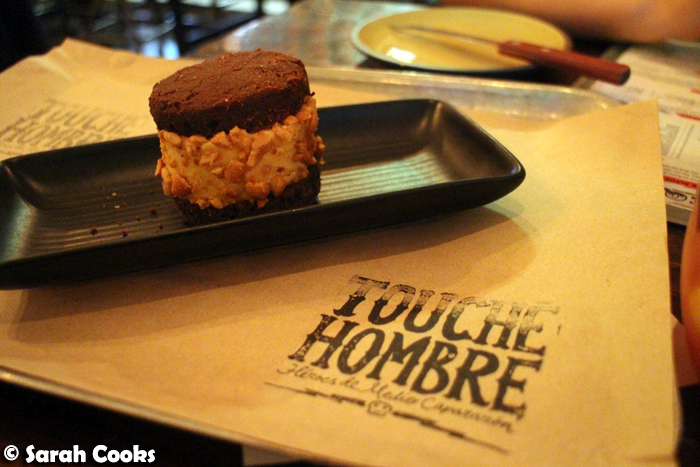 I visited Touché Hombre a couple of years ago for my friend Adri's birthday and really enjoyed it, so I was looking forward to visiting again. 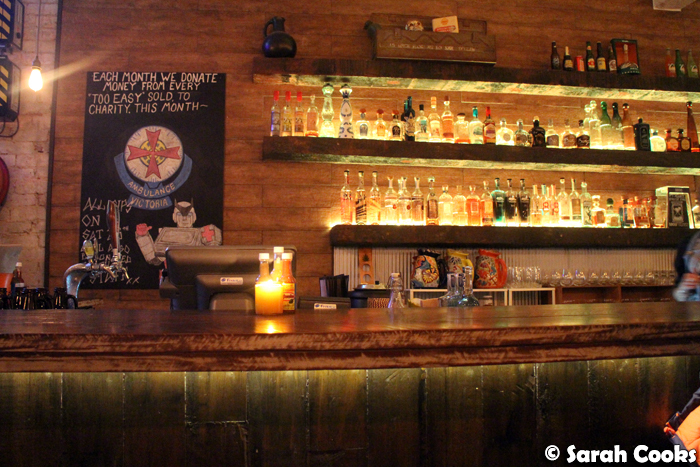 You may remember that at the time I was deeply suspicious of both "modern Mexican" (I'm less fussed about that now) and no-bookings policies (still not a fan), but even so was impressed with Touché Hombre. 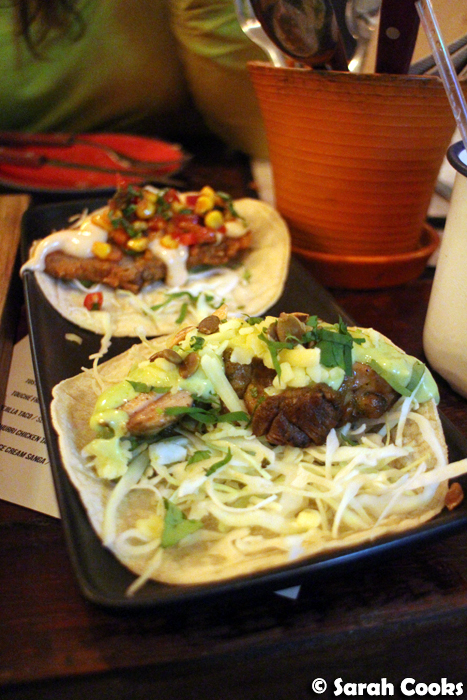 Since my last visit, I see that they've kept the fun and tasty modern take on Mexican food (yay), but gotten rid of the no-bookings policy (double yay). We started with a Margarita del Tommy, a light and citrussy easy-drinking cocktail. Needless to say, it paired perfectly with the food. 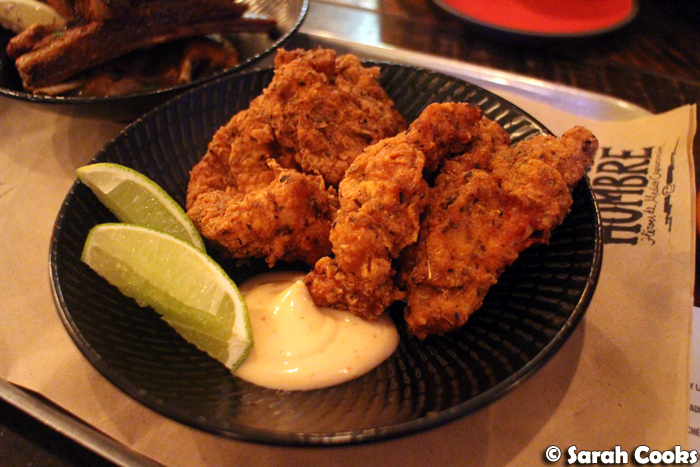 The Touché fried chicken was really great - moist chicken in a crisp and well-seasoned batter, with spicy habanero cream and sprightly lime on the side to keep it nice and bright. I am so glad the lamb ribs remained, because they were one of my favourite dishes from last time. 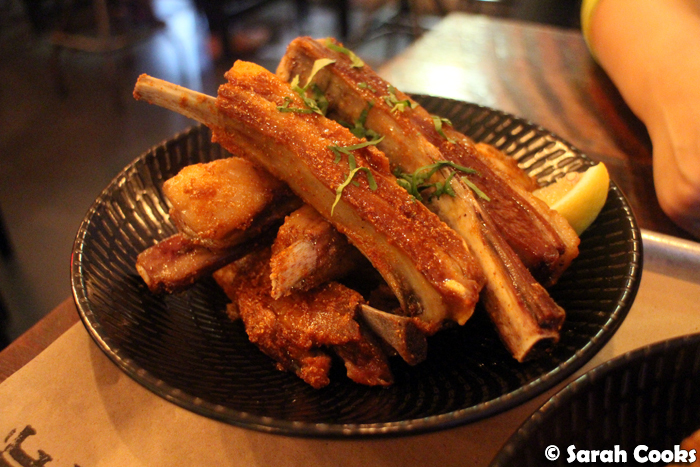 (I see they've been renamed from "fatty" lamb ribs to "spicy", but they were still delightfully fatty.) The meat was super tender and I loved the earthy mix of spices and the sweetness of the honey. Tostaditos aren't the type of thing I'd normally order myself, as I think that the heartier dishes tend to provide better value for money (and see above lamb ribs and fried chicken for two examples! 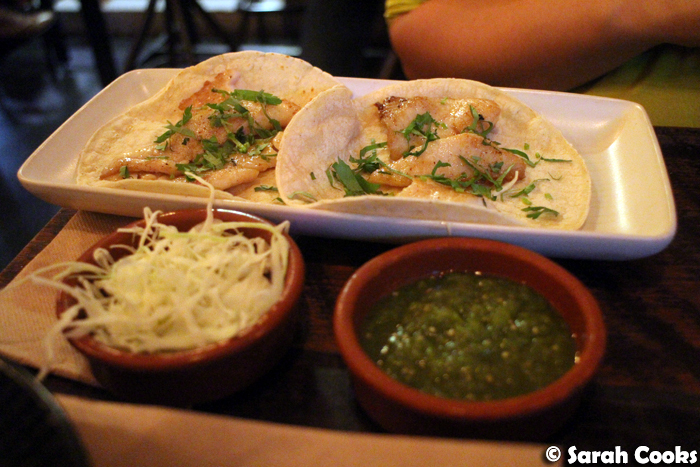 ), but still, I really enjoyed these crisp little tortillas piled with toppings. 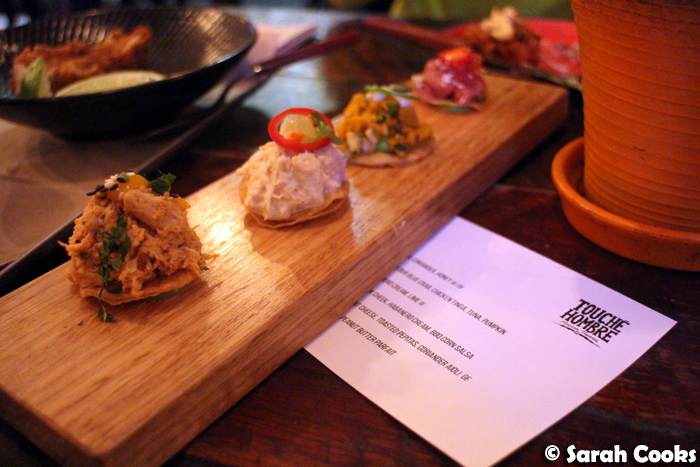 Each topping had a really distinct flavour and a nice texture - our favourites were the raw tuna with black sesame, soy, and candied peanuts, and the chicken tinga with spicy chipotle mayo. Time for another drink! 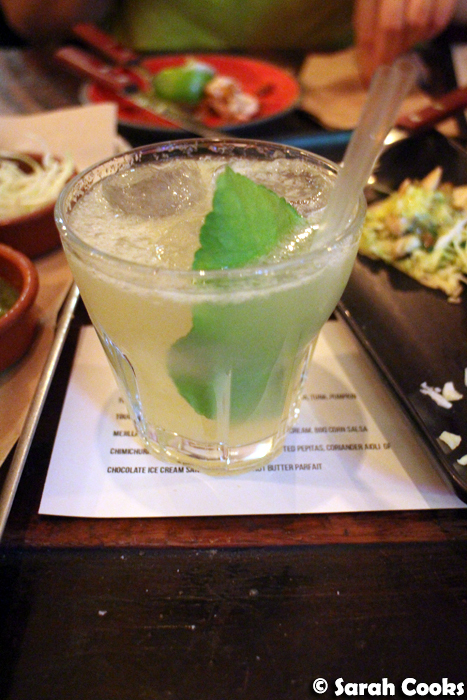 This kaffir lime and chilli margarita really packed a spicy kick! It was both refreshing and warming, at the same time. Tacos! Both the chimmichurri chicken taco and the mejilla (slow-cooked pork cheek) taco were tasty, but I really, really loved the mejilla taco, with its crispy pork, spicy habanero cream and smoky BBQ corn salsa. Give me a plate of those for dinner and I'd be a happy girl! Now, my cousin Catherine has a whole lotta dietary requirements (it's easier to ask her what she can eat than what she can't eat), but for the evening was happy to pick around what she could eat and have little bites of the things on her "no" list, just to taste. However so that she could have something proper to eat, the kitchen kindly put together a nice fish taco for her, with cabbage and salsa verde on the side). Speaking of dietary requirements, vegetarian, dairy free and gluten free options are clearly marked on the menu, and the venue manager, Rich, told us that they can deal with most dietary requirements with some advance notice. Wait, another tequila cocktail? Well, if you insist! We finished by sharing a chocolate ice-cream sandwich, filled with peanut butter parfait. The chilli taste wasn't particularly prominent, and the chocolate biscuits were a little too hard to cut through, so Catherine and I split this in half lengthwise to share. Ingenuity! The parfait was smooth, with a nice peanut butter flavour, but I would have preferred crisper biscuits. 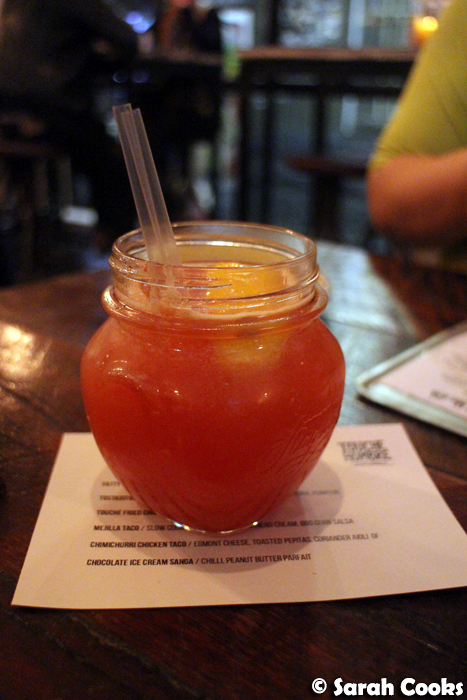 We had a fun night at Touché Hombre - it's a great spot for a casual meal with good food and nice cocktails - and I'm hoping to go back again soon. 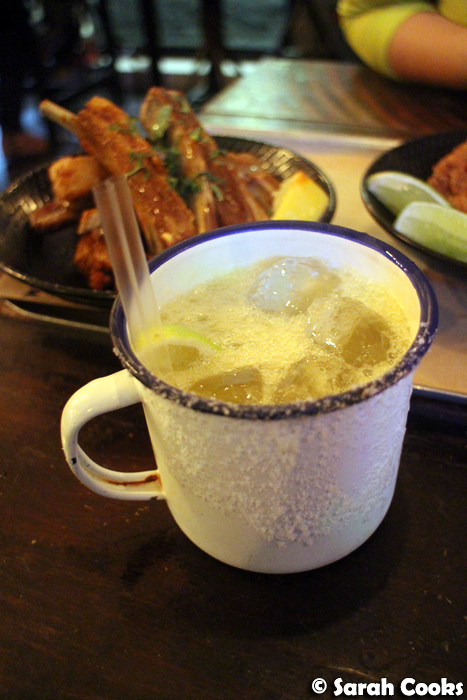 Fried chicken and margaritas, who's in? 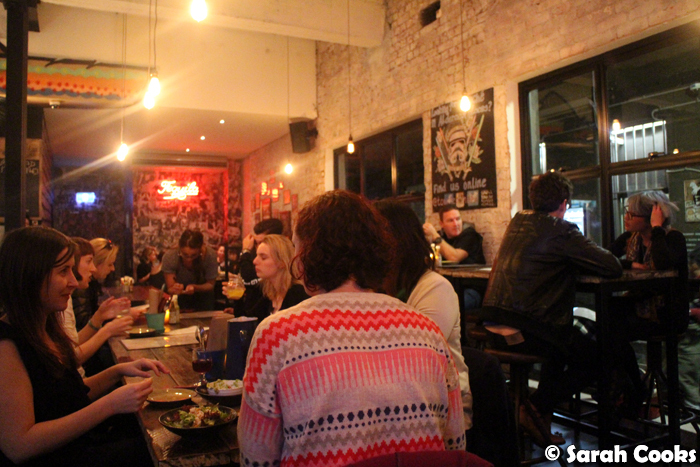 Sarah and Catherine dined as guests of Touché Hombre. The food looks SO good! I'm starving now thanks to this blog post :P And not a fan of no booking policies too-understandable in a small place but sometimes they're in force for large places too. That ice cream sandwich looks fantastic- I can see that this restaurant doesn't just follow the usual 'tacos and enchildadas' fare! BTW, are you on Twitter? I tried to follow you on Twitter but didn't see a connection. Any sort of Mexican floats my boat, I've always wanted to go here and I think my man would love those fatty/spicy ribs any day of the week!